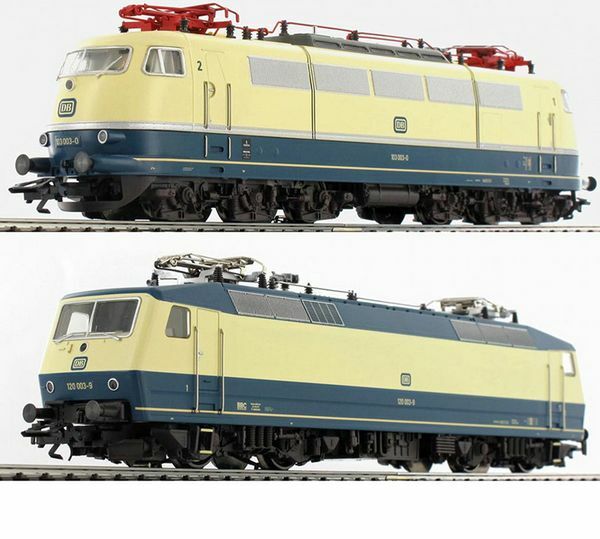 Double electric locomotive package, BR 103 + Br 120 mfx Sound. This show locomotive at the 2014 Toy Show is an electric locomotive series 103 003-0 equipped with a mfx digital decoder and numerous sound functions. Regulated motorization high performance. Adhesion bandages. Permanent function of the three-light and two red lights at the end of the convoy - reversal according to the direction of travel - in conventional operating mode, selection possible digital mode. Lighting provided by white-hot LEDs and maintenance-free red LEDs. Mounted metal hands. Detailed roof equipment.